KitMonsters – Hyde & Beast. The music makers’ guide to making music. 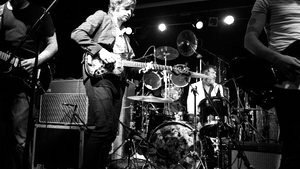 Hyde and Beast are a mini super-group, out to make songs they say are “a gentle summery psychedelic mess”. It’s a gorgeous and unexpected sound coming from a duo of drummers. 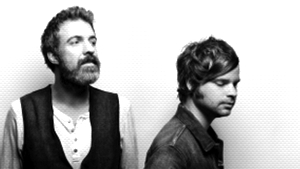 The band was formed by two leading figures in the North of England music scene - Neil Bassett of the Golden Virgins and Dave Hyde of The Futureheads. Their debut album Slow Down has won rave reviews and they are playing key festivals over the Summer including Secret Garden, Kendal Calling and Chase Park. In the studio Hyde & Beast love using older recording techniques and have been dubbed “sonic timelords”. They want people to feel they are relaxed and floating downstream, and they’ve achieved it judging by the two singles out so far, Never Come Back and You Will Be Lonely. On tour the Sunderland-based duo are accompanied by friends that include Dave’s brother Barry, the singer with The Futureheads. Neil says the recording process of their album “Slow Down” was very organic, and evolved, rather than being a deliberate change from work with their other bands. We never discussed between us what we were going for. We didn’t do it in a traditional sense, sitting with a band writing some songs, rehearsing and then recording them. Dave would have a tiny smidgeon of an idea and instead of working on it beforehand we just went into the studio and recorded to see how it went. A lot of the things were getting recorded as we were writing them. It was more akin to cooking than song-writing, where you experiment with food and see what comes out the other end. ‘Let’s see what would happen if we put some marmalade on fish’. Then you realize it doesn’t taste very good so you cover it in onions to disguise it but the marmalade is in there still. It’s like experimenting as we went along. The two of them had known each other for years from local gigs and bands and first met at a night promoted by the current editor of Kerrang, James McMahon. I think Dave was still at school when I met him. He came up to me in this music venue wearing a red velvet smoking jacket and trying to bum cigarettes off people. The first time I met him I thought he was a bit odd. The drummers both got record deals at the same time and were then away a lot. When The Futureheads took a break after recording their last album the time was right to get together. Neil has his own recording studio, Room 3 Recording, and works with rock bands during the day. In his time off he seeks out less well-known sounds and he would invite Dave round to hear unusual music such as Turkish and Ethiopian songs. When Dave came to record one of his own tracks, Neil soon got more involved in the songwriting. It was never intended to be played to other people it was just for us to listen to really. We thought it had to be a secret and no-one would like it. They found themselves with enough material for an album and Dave’s brother Barry passed it on to The Futureheads’ management who encouraged them to release it. So how did the two drummers decide who should do what on the album? They didn’t need to fight it out, Neil says. He produced the songs, did a lot of work on lyrics, and plays drums and keys. Dave plays most of the other instruments on the album - it was a chance to experiment with new kit and he went for it. He’d turn up with a different instrument pretty much every day, one that I was never aware that he could play. He turned up with a violin one day, ‘I’ve just bought this, let’s put this on a song’. A lot of the instruments he turned up with I wouldn’t describe him as a virtuoso in, but we managed to get good sounds out of them. Dave plays pretty much all of the guitars and the basses. I’m always reading books about recording in the 60s and it’s like The Rolling Stones would pop round to The Beatles when they were recording and they’d all play on each other’s records. If anybody did turn up, which they did, I’d say ‘pick an instrument and record something’. The key musicians apart from Neil and Dave were Simon Dennis who played trumpet and joins them on tour, and Dave Brewis on bass guitar. Lucas Renney (ex Golden Virgins front man, solo performer and also touring with Hyde & Beast) played guitar parts that “really made things sparkle” especially on the song Never Come Back. All their contributions really make the songs says Neil. Hyde & Beast recorded one song a day for 14 days, a really fast work rate – but the recording was spread over two and a half years as they weren’t both free very often. My favourite song is “If You Could Buy Me Anything”, it’s the most ‘out there’ sounding one, it sounds doped up and slow almost as if the song is melting. When we play live we often play things slower, especially that one, where most bands play things faster live. They use a variety of drum set-ups and on stage Neil uses a Remo Quadura kit. I played drums on my knees for two years while I saved up to buy my first Remo drum kit. I’m still loyal to them. always had Remo kits. They are built like tanks, they’re like the Saab of the drum kit world. In the Golden Virgin days I used to smash my drum kit quite a bit, not so much anymore. It was handy having one that wouldn’t break, that was really sturdy. For recording they purposefully changed drum kits for every song and sometimes even half-way through a song, particularly with snare drums. 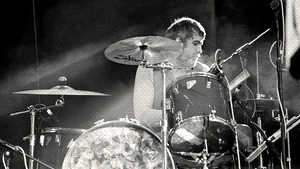 They used Dave’s vintage Gretsch drum kit which he plays with The Futureheads. It has a massive 26” bass drum. Neil also played Dave’s tiny Premier Olympic 1960s bass drum when they wanted a more 60s sound. They went for original kit rather than “studio trickery” to create their music. But the strangest thing Neil says is that despite both of them being drummers, the drums on the album were an afterthought, recorded last, even after the vocals. It’s something that’s very difficult to do and turns traditional recording techniques on their head. It made it harder to play along to, but gave it a loose woozy slightly out of time feel. The songs were built, almost recording themselves. We’d come back to songs and there’d be things on there we definitely didn’t play, it was like there was voodoo in the studio! In the video to Never Come Back, Neil’s sparkly drum kit looks very pared down. Live he uses one more tom and one more cymbal than on film. The kit is dramatically customized with a multicoloured feather drum skin – something they did themselves and that became the front cover of their album and website artwork. Dave keeps coming up with strange ideas like making papier maché cats. He’s artistic but a bit kooky. We bought bags of feathers, a lot of tubes of superglue and a bottle of gin. We spent an evening in my living room drinking gin and gluing feathers to a drum. 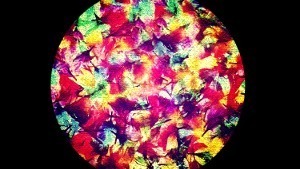 When we put a lamp inside it looked amazing, like a stained glass window. It was a bizarre day - no ventilation and the gin, we ended up a bit giddy! Their gigs so far have mostly been in small venues and all sold out. It was very different for Dave being the front man for the first time instead of the drummer. He’s settled into the vocals now but for the first couple of gigs he was on edge. I’d never really thought about the vocals but he was asking all kinds of questions. 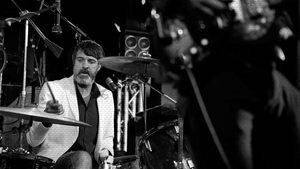 Our first gig was in a small bar and packed, with the audience standing right in front of you and he was saying “Where do I look?” At the back you are safe, the drum kit is like a castle. He’s started talking and things like that now. Dave has also helped Neil out with some cymbals for gigs. When it came to cymbals, I broke so many that I just used to buy the cheapest. Now I’m using Zildjian K’s that Dave gave to me and they are very very nice. He doesn’t like to talk drum jargon and finds most, but not all, other drummers embarrassing. The best drummer that I’ve seen play live is a friend of mine Dave Brewis from Field Music who has played bass for us. I’ve been on tour with them quite a few times and got to watch him close-up from the side of the stage. It’s astonishing how he makes the sounds from the drum kit that he does, with the same amount of limbs as the rest of us. Someone once described his drumming as an “octagroove” as it sounds as if he has eight arms when he is playing. Dave Hyde plays a vintage 1968 Audition guitar that is very characterful according to Neil. They were mass-produced in Japan in the late 60s and 70s and sold over here in Woolworths for £5 or £10. It’s a piece of junk really but I love the way it looks, it looks like a 1960s vision of what the future would look like. It has 3 pickups that are very hot and very loud and most guitarists would hate the sound of it. It’s a very twangy, 1960s rock sound. It’s a piece of junk that keeps falling to bits but we’d be lost without it. We keep meaning to get a spare because if this one breaks we’ll have to retire. They’re starting to become collectors’ items but you can still get them for £50 - £250 on ebay. The other beautiful thing about it is it’s a small guitar – the same length as normal but the body is very small and it has a handmade case. When Dave’s carrying It he looks like he is an assassin as there’s no way you’d think a guitar could fit in that case, it has to be a sniper’s rifle. 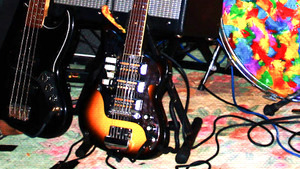 The vintage vibe was a key part of the recording process. Neil records onto computer but gets an analogue feel that’s been commented on in the album reviews. When they were recording vocals they used Neumann valve mikes, M149 and M147. It warms up the sound and gives it a grittier and more tape-like feel. I also use a lot of cheap ribbon mikes that have a thin metal ribbon inside that vibrates, and you don’t get a lot of treble or top on them. They tend to sound darker and richer. We tried different things when we were recording and did the opposite of the manuals, just to see what would happen. We tried to use things that were around in the studio as I don’t like using computer effects. On one song Louis’ Lullaby there was a bass solo. We played bass through an amp and put the big floor tom against it and miked that up, so we got this sound that was the bass passing through the drum. There’s probably a button on the computer you can press that gives you the result in a quarter of the time but it feels like cheating and it’s nice to know that it’s real things making these sounds. It’s also fun figuring it out. Neil’s first instrument was a windblown plastic Hohner organ or melodica someone found in the family’s loft. He hankered after a modern synth but it was not to be. Now he wishes he had kept the beige Hohner so he could have used it on the new album as an authentic 70s sound!